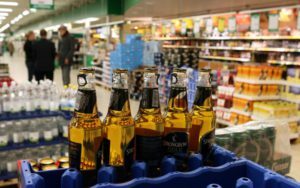 With a 49-40 vote, the Riigikogu on Wednesday passed amendments to the Alcohol Act and Advertising Act which will restrict alcohol sales and advertising conditions. The law will change provisions in the Alcohol Act concerning the regulation of alcohol sales, presentation of alcoholic products and identification of the age of the buyer in the sale of alcoholic beverages. It will also stipulate the opportunity to conduct control transactions to improve surveillance in order to ensure better adherence to the ban on alcohol sales to minors, as well as make the fight against illegal alcohol sales more efficient. The law will change the provisions of the Advertising Act that restrict the content of alcohol advertisements, amend the list of locations where alcohol advertising is banned, and clarify provisions that restrict the advertising of alcoholic beverages with the help of cheap prices as well as the advertising requirements set for health warnings. Alcoholic beverages for sale at Kristiine Prisma. The aim of the law is to protect public health, reduce social, economic and health damage caused by alcohol consumption and ensure a supportive environment in which for for children and youth to grow and develop. Several amendments were proposed for the bill. One amendment stipulates that alcoholic beverages in stores must be displayed separately from other goods so that consumers would not be forced to come into contact with them during their shopping. According to the amendment, the display of alcoholic beverages must not be visible from the rest of the sales floor or from outside the store, except in cases when the fulfillment of these requirements is not reasonable due to the limited size of the sales floor. The aim is to reduce the visibility of alcohol in public spaces and enable underage persons and addicts to shop without having to come into contact with alcoholic beverages, as well as reduce the amount of impulse purchases of alcoholic beverages. Another amendment was introduced to the bill according to which local governments will be given the right to regulate the retail sale of alcohol for on-location consumption at night as well as decide whether this will take place across an entire municipality or in only parts thereof. The plan is to amend the Advertising Act so that it will be allowed to present only information central to the product or neutral information about the main characteristics of the product. The aim of the amendment is to reduce the impact of alcohol advertising on the formation of values and social norms widespread in society, especially among underage persons. As handling the bill took longer than planned, the dates of entry into force were also changed. Provisions concerning advertising restrictions are to enter into force on June 1, 2018. Stores, meanwhile, will be given a year and a half for the reorganization of their premises, and the provisions affecting them are to enter into force on June 1, 2019.